A good pork pie is a wonderful thing. Flavoursome pork coated in jelly and encased in crispy pastry. But 'Melton Mowbray Pork Pie' is now an EU protected name, so this is *not* a Melton Mowbray pork pie. Sorry 'bout that. Melton Mowbray pork pies are what is known as 'raised' pies, meaning the pastry is raised around the outside of a former (traditionally a wooden thing called a 'dolly'). I use a small wine tumbler as a former because it is the perfect size for the job. This is the traditional pastry used for pork pies. Pour the water into a pan and add the lard cut into chunks. Bring to the boil. Remove from heat when the lard has all melted. In a large bowl, stir the salt into the flour. Add the water and lard and mix thoroughly. Tip the dough out onto a work surface, and knead it slightly to make sure everything is well mixed - but be careful, it's hot! Wrap in plastic film and put in the fridge until cool. Some people say to use the pastry while it's hot, but I've never had any success with that. The seasoning mix I use is 1 part salt, 1 part ground black pepper and 2 parts finely ground sage or thyme. Authentic pork pie recipes call for the pork to be hand-chopped. But this is not an authentic recipe. Chop the bacon into 1cm (half inch) pieces and mix with the minced pork and seasoning. I will be using a small glass tumbler as a former for the pies, so you can also use that to measure quantities of filling just by lightly pressing it into the glass, leaving a 1cm (half inch) gap at the top. Remove the filling from the glass and place it in the fridge until you need it. Roll out the pastry to a thickness of 3-4 mm (quarter inch). Cut some discs of pastry for the lids using a bowl or cutter that is a slightly larger diameter than the glass tumbler. Set aside. Cut the remaining pastry into pieces about two and a half times wider than the tumbler. For each former, smear butter around its outside edge and bottom, and then roll it in flour. Place an empty tumbler upside down on your worktop. Lay a piece of the rolled-out pastry on top, and form it to shape by gently pressing the pastry together round the edge. Work the pastry until it is a uniform thickness and quite smooth, using a bit of water to stick down any overlapping flaps of pastry. Put it in the fridge to rest, but don't let it chill too much. Preheat the oven to 180℃ (355℉). When you're ready to build the pies, remove the cases from the fridge and peel the pastry shell off the glass (this step can be tricky, but don't give in!). Pop a chunk of the meat mix in, and moisten the edge of one of the lids. Place the lid on top of the meat, making sure the rim of it points upwards. Press the edge of the lid against the top of the case to form a tight seal. Smooth out the rim and crimp into any pattern you wish. Traditional pork pies are baked without any support to their sides, which means they will bow outwards during cooking. I usually support mine with a well-buttered steel ring. Brush the tops with a mixture of beaten egg with a small amount of milk added. Put the pies in the oven and bake for 40-50 minutes. If you are using some kind of ring to support your pie, remove it after half an hour to allow the sides of the pie to cook. Remove from the oven and cool on a wire rack. 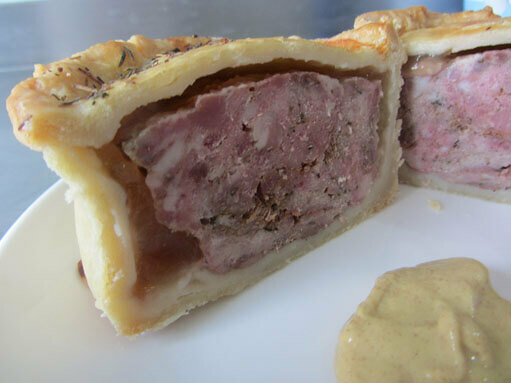 Traditionally, the jelly in a pork pie is made using a pork stock containing pigs' trotters, which are high in gelatin. It takes hours to make and is a bit stinky. I prefer to use agar agar, a gelling agent derived from seaweed. Bring the chicken stock to the boil, mix the agar agar with a little water and dissolve it in the stock. Inject as much as you can into each pie using a syringe (or 'flavour injector'). Pork pies are usually eaten cold. Serve with a bit of salad and some English mustard. If you're feeling a bit Northern, pease pudding is a good old-fashioned accompaniment. The video above is from the Keef Cooks YouTube channel. Click here to see the video recipe of Melton Mowbray-style Pork Pie on YouTube. Prep time: 30 minutes. Resting time: 30 minutes. Total time: 1 hour 40 minutes.